Morphine sulphate is a type of medication used to ease chronic or acute severe pain, mostly in individuals suffering from cancer or other serious illnesses. In many cases morphine sulphate is administered orally provided that the patient is conscious and in need of a constant analgesic. On other rare occasions the medication is given to patients with acute pain, or those who are recovering from surgery. Sometimes it is given before a procedure if the postoperative pain is expected to last for a prolonged period of time and be fairly intense. Some patients receive morphine sulphate epidurally and while their pain in eased their main sensory and motor functions are not affected. Morphine sulphate is only prescribed when the patient is responding to no other pain relief medications. As it is a very serious drug, only trained professionals in morphine administration and pain management should be giving the medication. The injection given epidurally is mostly employed after major surgery. In addition, as soon as there is a concrete diagnosis, in many cases in emergency rooms, morphine sulphate should be administered right away as there is no need to hold up so that the medication does not interfere with tests that have to be done. When it comes to outpatient care, morphine sulphate should still be administered as required for pain management. In some instances the patients might have a physical reaction to the medication characterized by high blood pressure and heart rate, and other disorders of the circulation system. In such cases the dosage that is necessary to relieve severe pain should still be given to the person. The long term negative effects of morphine on the body, and especially the brain, are vast, but the medication is usually provided for terminally ill individuals who are in extreme pain so the benefits in their case outweigh the consequences. Morphine sulphate should be the last resort for pain relief as it can also lead to dependence. Administering the medication is small doses sporadically usually does not yield the desired results. Rather, the drug accumulates in the body without producing any effects. The most common reasons for trying to decrease the dosage include attempting to avoid respiratory and sympathetic nervous system problems. In order to be given morphine sulphate it is recommended that the patients describe their pain on a scale from one to ten to their caregivers. Morphine sulphate essentially depresses the organism and can lead to hypotension but this shouldn’t be a major concern. The point of the medication is to elevate pain while the adverse effects are often neglected. Further, there are other medications that can be used to ease the side effects. For instance, naloxone hydrochloride is employed for treating respiratory problems and it does not interfere with the desired effects of the primary medication. 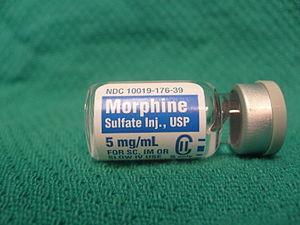 Morphine sulphate is also given to patients who are battling pulmonary edema as it produces cardiovascular relief. In such patients the medication should not be used if the respiratory problems are due to pollution, or brought on by a chemical. When it comes to the ways the drug is administered, it can either be taken orally, inserted rectally, or injected intravenously. Depending on the condition of the patient and his or her needs, sometimes the injections will cause irritation and additional pain so other means are chosen. Intravenous administration provides continual comfort and reliability, and causes very few problems. Other medications could be administered to ease the process of absorbing morphine sulphate and for avoiding some of the complications. The dosages have to be carefully prepared and administered within a proposed period of time in order to avoid the risk of overdose. The risk of overdose is increased if the medication is given via injections as this method is the easiest to use when abusing morphine sulphate, which is essentially heroin used for medical purposes. Special means of control are often implemented in hospitals to make sure waste disposal is properly managed and access to certain areas strictly restricted. In addition, when the medication is administered orally it is given in traditional tablets, as a solution, or via extended release preparation. The extended release capsules and tablets can be given at any time as they do not interact with food although more research is needed to provide further proof for the premise. When the medication is administered orally the tablets should not be broken or divided in half but should be swallowed as a whole. The main reason why the tablet should be taken intact is because chewed or crushed tablets can lead to a fast release of the substances and result in ingesting a potentially lethal dose of morphine sulphate. Under no circumstances is the medication that should be administered orally ever mixed with alcohol or other illicit drugs. could this be drug withdrawls or serious condition?